Shaped like the end of a trilogy (despite a proposed sequel), The Chronicles of Narnia: The Voyage of the Dawn Treader heads to its appointed port, loaded to the gunwales with a cargo of moral lessons. The opening sets the stage well. Director Michael Apted includes scenes of the big war in Cambridge, where workmen are tearing down the fences for scrap iron for war material. The elder Pevensies, Peter and Susan, are in America. 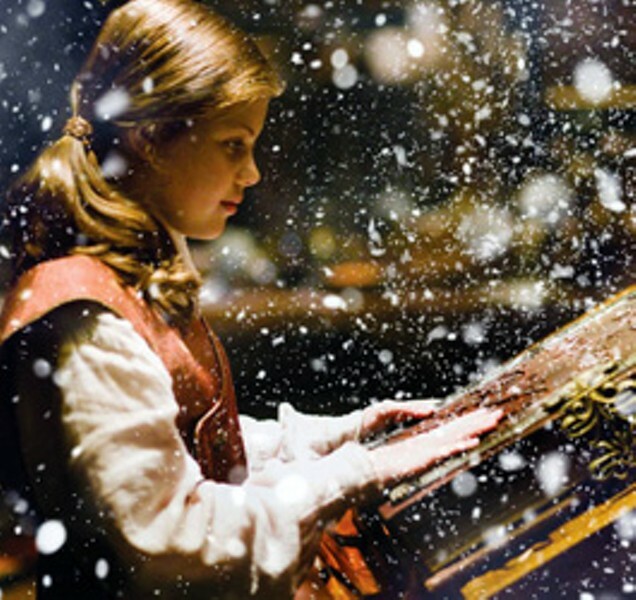 Left behind are two younger children, Lucy (Georgie Henley) and Edmund (Skandar Keynes), who are billeted with their hateful cousin Eustace. Inundated by an enchanted painting, Lucy, Edmund and Eustace end up bobbing in the sea right next to the Narnian navy vessel containing Prince Caspian, who is investigating the vanishing of seven peers of the realm. Eventually, seven golden swords have to be rescued and placed on the altar of Aslan. The shipmates encounter invisible one-legged giants, a green mist that envelops sacrificial humans and a dragon's treasure hoard cursing those who steal it. It's no secret that C. S. Lewis imbued his writing with Christian tenets, and during the voyage, religious allegory starts to poke out. The earthling children are tempted by such of the seven deadly sins as might lure a child. Lucy wants beauty, Eustace is lured by gold, and Edmund wants power. A child, slowly getting the picture—it's about straightening up and flying right—might be more perked up by the film's particularly disgusting sea-serpent, studded with claws inside its mucousy-looking mantle. There are times when the Narnia movies are as good as CGI gets. The animators challenge themselves to pose their legions of creatures under high-noon lighting, instead of disguising the flaws with half-shadows or twilight, and Caspian's dragon ship is tangible against the Maxfield Parrish&–like magenta clouds. Another plus is Will Poulter. The bad boy from Son of Rambow plays stinky cousin Eustace, whose shirking and filching provide a welcome counterpoint to the well-bred Pevensies. Full of potential, Poulter is as close to a serious young actor as this series has fielded. For this insallment, the fencing mouse Reepicheep is voiced by Simon Pegg instead of the previous films' Eddie Izzard. This time, Reepicheep has more Ronald Colman&–style politesse than the last installment. Certainly, the mouse is braver than the Holy Lion himself, who, typically, ducks out on the final fight. If this is indeed the end of the road for the Narnia films, it explains the finale. It doesn't blow the ending to mention that Aslan coyly drops a hint of who he really is here, as if we didn't infer it from the previous two films (he was martyred, rose from the dead, is able to heal the sick, etc.). I can remember reading The Voyage of the Dawn Treader in childhood and feeling like I'd been promised a trip to Disneyland, only to be dropped off at Catechism. Even adapted for Hollywood, not much has changed in the story's mission. The Chronicles of Narnia: The Voyage of the Dawn Treader' opens in wide release Friday, Dec. 10.